From the inventor of 8-minute abs! 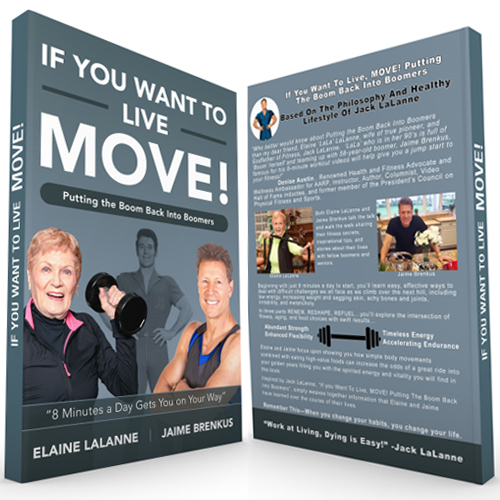 If You Want to Live, Move! is an updated and simplified program that empowers you to take the right action each day on a consistent basis so you can realize the rich rewards that are rightfully yours – energy, strength, and renewed health. This book is designed so that you can quickly access the nuts and bolts of our program and get right to it. We have laid out this book to be an easy (and illuminating) read. If you need more information and motivation, we have included additional resources for that, as well. After purchase, you can download the ePub, MOBI or PDF version for reading. For more info, see description section. In this book, you’ll learn easy, effective ways to deal with difficult challenges we all face as we climb over the next hill, including low energy, increasing weight, sagging skin, achy bones and joints, irritability, and melancholy. But our main focus will be on showing you how moving your body and eating high-value foods will increase the odds that you ride into your golden years with energy and vitality. MOBI – This format can be read by KINDLE users. PDF – This format can be read by just about every desktop, laptop, tablet or smartphone. OnDemand Access – FREE MEMBERSHIP! 8 Minute Workouts isn't just another workout program. It's the most efficient and effective workouts because it's based on maximizing your effort over 8-minutes. 8-minutes is all you need to achieve your goals. It has created a revolutionary new exercise method that is easy yet highly effective for beginners to advanced, all ages and fitness levels. Intense total body transformation training. Lose Weight Without Deprivation…50 ways to slash calories. Sign Up and we will alert you to new workouts or online discussions!